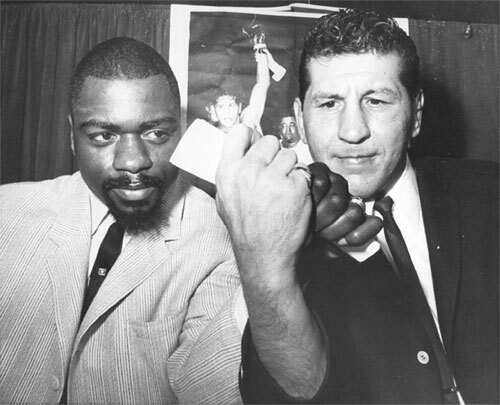 On this day in 1964, Joey Giardello defended his world middleweight title against Patterson, NJ phenom Rubin 'Hurricane' Carter. The fight is legendary for its competitiveness and its closeness, although the official scorecards were unanimous for Giardello by a comfortable margin (in rounds: 9-3-3; 9-4-2; & 8-5-2). Carter was dangerous and tough, particularly in the first half of the fight. But it was Giardello who set the pace and controlled the action with his ring savvy and movement. After the 15 rounds, Joey's face was badly marked and looked the worse for wear, while Carter, a huge chiseled rock of a middleweight, looked untouched. Despite the official cards, the consensus was that Giardello won the fight, but by a much closer score. In recent years, thanks mainly to an unfair depiction in the film "The Hurricane", this fight gained a reputation as being far closer than it actually was. According to the movie, Carter was robbed. But in reality, that was not the case.